Over the years, They Might Be Giants have released many recordings on vinyl. A brief summary of these releases can be found below. This was their first officially-released recording, consisting of a one-sided 7" flexi-disc, accompanied by two thick pieces of paper, serving as the front and back covers. Features three demos from the 1985 Demo Tape, the only instance of these tracks on a medium other than cassette. The B-side features two tracks by longtime TMBG collaborator Joshua Fried. The album cover of their debut album reveals that the artwork on most CD versions is both cropped and much less color-saturated. Both labels feature pictures of the Johns. Side 1: "Johnny Call Home (718) 387-6962"
Side 2: "25 hours a day 6 days a week (718) 387-6962"
The labels of the Rough Trade UK, German, Spanish and Greek LPs feature a similar layout, with the photographs replaced by same drawing of the Johns on a dog that is found on the back of the Don't Let's Start (EP) CD longpack. The artwork for the vinyl and cassette release is the more famous than the CD, featuring a snowman warming himself over a pile of burning money, whereas the CD features an image of TMBG performing live, which is found uncropped on the back of the vinyl. The label has a picture of William Allen White. The Dial-A-Song number is scratched between the leadout grooves on both sides. The German Rough Trade release runs at 45 RPM, and features a glaring typo on the A-side label. This was later re-released in Europe by Elektra with a revised track list on both vinyl and CD, featuring completely different artwork. The vinyl cover is the same as the CD, except the that colors are richer, and the art runs off the edge at the top and right. The track listing for the vinyl is very confusing. The actual arrangement of tracks is different from both the stated track listing and the CD track listing. The B-side label has art done by Mark Marek. Side A: "Motel Directive Wigue Wigue Wishnick"
Side B: "It is dangerous to be sincere unless you are also stupid"
Playing just Ana Ng on both sides, this came in a plain white sleeve with a sticker. Both labels are identical. The vinyl artwork is the same as found on the CD, with the addition of the text "THEY MIGHT BE GIANTS" in red at the top of the image. The back features an image found in the CD booklet, with the track listing in a vertical column on the left and the title LINCOLN at the bottom. The labels feature the sketches found on the CD. Side 1: "I don't want the world"
Side 2: "I just want your half"
Domestically, the lyrics were printed most commonly on an inner sleeve, though some pressings utilized an insert. The background photograph, which was of another shrine built by Brian Dewan, was printed in light green ink domestically and for most international releases, except Italy and Sweden, where the ink was red or black, respectively. Most the international releases also printed the lyrics on an inner sleeve. All vinyl European releases use a slightly different version of the cover photograph. The reason it was sent to One Little Indian is unknown, but it propagated in Europe due to the fact that OLI was the European distributor for the album. More detailed information about vinyl releases of Lincoln can be found here. The front and back covers feature drawings of the observation towers from the 1964 World's Fair, also visible in the Don't Let's Start video. The Chinese character on the front cover means "posture". This 7" single's front and back covers feature a wrap-around photo of John and John standing with their instruments at the Lincoln Memorial. The cover art features the text "THEY MIGHT BE GIANTS" and the names of the songs — descending in size according to track order — against a photograph of wood models of faces by Hiroko Hoshikawa. The back has the lyrics and a photograph of TMBG in Linnell's old apartment. The A and B side labels are red with white text saying, respectively, "BE" and "MIGHT". This does not include "It's Not My Birthday" or "Nightgown Of The Sullen Moon", likely due to the presence of those tracks on the UK release of Ana Ng. The B-sides are instead "I've Got A Match" and "Kiss Me, Son Of God". The cover art features the same design as the US release, with different text corresponding to the different track listing. For reasons unknown, the art is magenta-tinted, instead of red. The back is essentially the same, except that the photograph is cast in the same magenta monochrome as the front. Released in France and Spain, the cover features a portion of the Lincoln cover photo, as well as two of Linnell's accordion drawings, while the back is a crop of the picture from the back of Lincoln. The Spanish sleeve is made of textured paper. This came in a plain white sleeve with a sticker and label that used red-tinted portions of the photo found on the back of the EP. Not only do both sides contain the same song, but both labels are also identical, including the designation "SIDE A". The insert for this LP includes the lyrics to each song, set against a background consisting of the text "THEY MIGHT" (side A) and "BE GIANTS" (side B). This was one of only three commercial 7" singles released by Elektra in the US. This single is very rare for unknown reasons, and came in a company sleeve. The domestic 7" single and the 12" promo are the only TMBG releases on Elektra to bear a pre-1990 date. This was TMBG's last album to be released on vinyl in the US until 2007. The vinyl artwork is a larger crop of whole photograph used for various Flood releases than that found on the CD. This was TMBG's first release to use a gatefold cover. In Germany, the standard European release was sold with the addition of an insert containing the lyrics translated into German. The only difference between the vinyl artwork and the CD is that the CD includes the small text "5 INCH CD SINGLE". A small number of the UK pressing used red and black 1980s-era Elektra labels, likely because the plant was using up its remaining stock. This is the only known TMBG release to use these labels. This was only released on vinyl in Europe. Some copies of the 12" release came with a large poster with the full Flood cover image. These promotional releases all had plain sleeves with stickers. The 4-track version had 3 remixes exclusive to that release, and features the message "V V Hit Factory DMS – cg ? YEAH...RIGHT!!" between the leadout grooves on side A. This appears to be a quality-check test pressing, containing "Twisting", "James K. Polk", and "Ant", all of which appeared on different Flood-era releases. This was the last domestic 1-track vinyl radio promo released by TMBG. The vinyl release of this was exclusive to Europe. The vinyl artwork is a slightly cropped version of the CD, and lacks the text "CD SINGLE". The last album released on vinyl until 2007, the LP was released in limited numbers only in Europe. There are only minor differences in the vinyl artwork compared to the CD. The text "THEY MIGHT BE GIANTS" and "APOLLO 18" are slightly larger, and the image of the whale and squid is somewhat darker. The back is the track list in a vertical column on top of an image found in the CD booklet. A limited-edition double-sided flexi-disc included with subscriber copies of the April 1992 issue of Reflex magazine. Features an exclusive demo by XTC, and the song "Moving To The Sun", which would not be commercially available until the summer. The vinyl release was exclusive to Europe, and featured a different track listing than the CD. The only significant difference in the covers occurs on the back, due to the different track listings on the CD and vinyl. This was a 7" released on translucent green vinyl, making it TMBG's first release on colored vinyl. The song "Christmas Cards" is exclusive to this release. This was the first TMBG release to feature a regular backing band. This Mono Puff single features completely different cover art than the CD release, as well as a different B-side. This came in a plain white sleeve with a square sticker. Features 4 remixes of "S-E-X-X-Y", which are exclusive to this release. A rarer commercial edition exists, with a black sleeve instead of white. Promotional 6" flexi-disc by John Linnell under the pseudonym of Johnny Hart, packaged with some promotional copies of the book Olive, The Other Reindeer. This is the single from Linnell's State Songs album. The vinyl is green with a marble pattern, and die-cut in the shape of the 48 contiguous United States. It comes in a clear plastic bag, and the labels feature silhouettes of the state whose state song is on that side. The song "Louisiana" is exclusive to this release. This is the first full-length TMBG album to be released on vinyl since Apollo 18. Like Flood, the cover is a gatefold. Much like Flood, the jacket is a gatefold with the lyrics on the inside. There are only very minor differences in the LP cover art compared to the CD/web version. The album comes with a card for a free MP3 download of the album. This was the first 7" record by TMBG since 1993, and the first of a series on the Idlewild label. TMBG released an exclusive 7" EP through the They Might Be Giants Instant Fan Club. This is the first in a series of pressings of TMBG's Elektra-era albums by Asbestos Records, and it marks the first time that TMBG music has been released on vinyl long after its initial release. Like TMBG's Other Thing Brass Band, this 7" from Idlewild is sold at live shows. 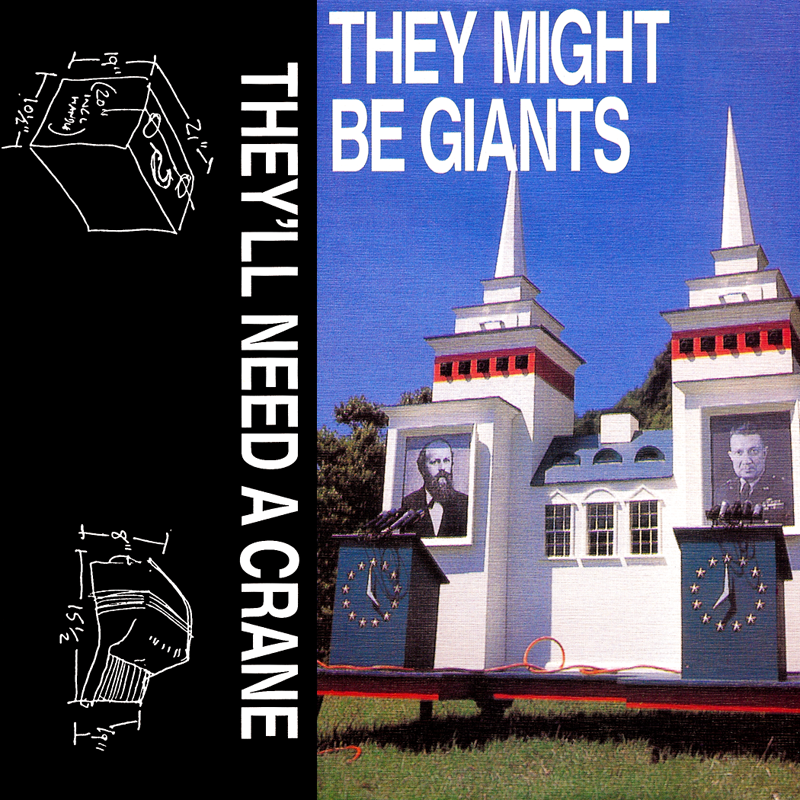 TMBG released a second exclusive 7" to the 2012 They Might Be Giants Instant Fan Club. Nanobots was the first TMBG LP packaged within a printed inner sleeve since Apollo 18 in 1992. Test pressings were produced in the Czech Republic in January. Issued by Asbestos Records across two discs in a gatefold package. TMBG issued a children's 7" EP that was exclusive to the 2012 They Might Be Giants Instant Fan Club. The Avatars Of They released their first EP through Idlewild Recordings. This is the first kids' album to be released on Vinyl. This album is released in a gatefold package.